First thing is first, make a Skinner Blend. NOTE: Keep in mind that this blend does NOT have to be large. You’re only going to use this to cover your heart, not make a complete heart out of it. To make your Skinner blend, cut triangular angles to join your selected colors of clay (as shown at right). Place into your pasta machine on the 2nd or 3rd largest setting of your pasta machine with the colors going left to right as shown in the photo. Pass through your pasta machine 20-30 times or until you are happy with the blend. My finished blend is show at right with fully combined colors. 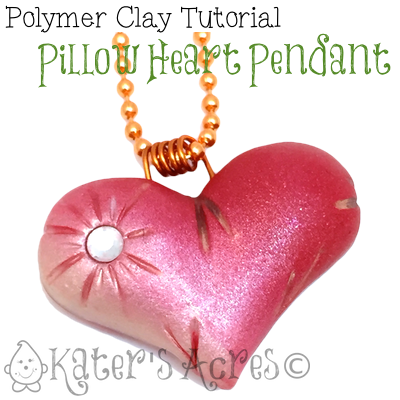 This heart tutorial is adapted from the tutorial on PCPolyzine. First start with a ball of scrap clay. Then roll that ball into a log. Now here’s where I vary my heart. Make the center of the log slightly indented and narrower than the rest of the log. I do this so that my heart has an eye-catching shape when it is finished. Then very carefully eyeball the center of your log and cut it an a diagonal, leaving equal portions on both sides of the blade. Then take one side of the log and invert it (turn it over). Place the two sides together and wah-la … a perfect heart, every time! To make your heart flat-backed, place it pointy side up and cut as precisely down the middle as possible. BRAVA! You now have two perfect hearts to cover and make pendants from. To finish your heart, use a knitting needle to close the seams. Take your skinner blend that you created previously and roll it out on the 3rd smallest setting of your pasta machine. Lay your heart on the blend in an area where you like the blend. Use an exacto knife to cut a shape about 1/4″ larger than your heart. Now lay your freshly cut skinner blend on top of your heart. Smooth the edges so it goes all the way around the heart, as close to the back edge as possible. You may need to use a knitting needle or small acrylic rod to help you. Lay your heart back down and cut another piece from your skinner blend just slightly larger than the heart itself. Pick the heart up in your hand and blend the seams from the bottom piece. NOTE: BE CAREFUL when adding your blend to the heart shape. You do NOT want to flatten and distort the shape. **TIP: If your seams are having trouble blending, use a very small paint brush with a little bit of baby oil on it and run it over your seams. This will soften them slightly and allow them to blend easier with your finger. Now comes the fun part … make your flat back puffy heart into a pillow looking heart. Add a flat-backed, hot fix crystal to the heart. You want to press this in until the clay “bubbles” up around the heart. This will help add to the pillowy look. Now take a needle tool and add little “dents” by pressing the needle tool straight down into the clay. TIP: Make small lines at first so you get the angles right. Once all your dents are made, use your needle tool to extend the lines. Make the extensions look random and not too exaggerated. You want to give the illusion that there’s tight knot in the pillow pulling the fabric down into itself. Make a bail using coiled wire and insert it into your heart, add a drop of Bake & Bond to the ends before insertion to help secure the clay..
Be sure to turn the ends of the wire so the bail won’t pull out after the heart it baked. Use mica powders & blending chalks, add details to your heart. Adding a DARK color (shade) of mica powder or blending chalk will add depth and a shadow. Adding a LIGHT color (highlight) will bring out the area you place the color and act as a brightener. For my heart with the copper & red blend I used Cappuccino Perfect Pearls & I accented it with interference red Pearl FX. TIP: For a muted highlight that really pops and isn’t quite as metallic, rub your finger over the powder. Bake your pendant at 275 degrees Fahrenheit for 45 minutes covered in foil. Watch the Video Tutorial from B’Sue Boutiques Too! You bet it is Andrea! I made several of them.